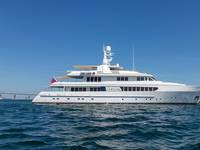 Larger boats can face power challenges when docking in smaller ports that don't offer 100A service. 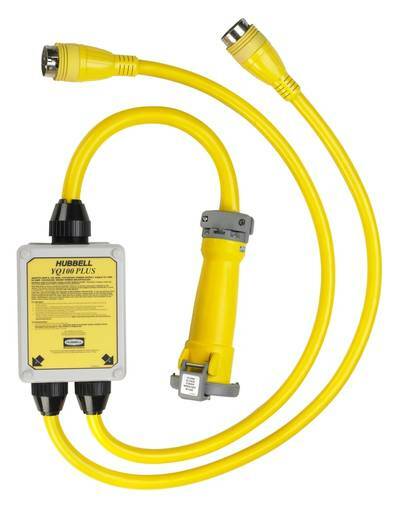 Hubbell Marine's YQ100PLUS power adapter is able to connect a 100A 125/250V AC boat to two 50A dockside receptacles. The YQ100PLUS features a small, lightweight NEMA 4x enclosure that is watertight and protected by sealing grommets. Safety features include indicator lights that provide quick visual confirmation at a distance of correct polarity at the dock receptacles. The unit senses that the two receptacles are from correct phases and that the plugs are fully engaged. The YQ100PLUS includes cord clamps on the 100A connector body to prevent strain on terminals. Molded plug terminals provide a secure connection to dockside inlets. This device also provides 50A power from a single 50A 125/250V receptacle. It senses when the single adapter "A" leg plug is in use for safe operation. The Hubbell Marine YQ100PLUS adapter must be connected to an onboard, center-tapped isolation transformer or shore power converter. MSRP is $3,800.